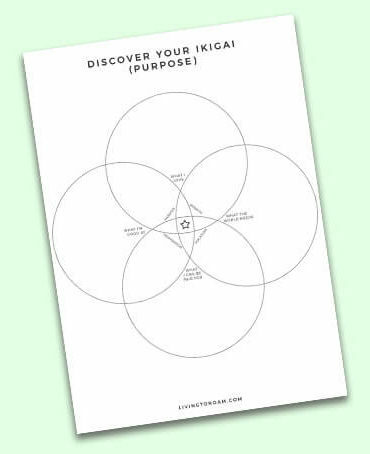 Subscribe to our newsletter and get instant access to your printable Ikigai worksheet to map out your true purpose! Thanks for subscribing! Check your inbox for your Ikigai worksheet! Recently I’ve started seeing a lot more podcasts, movies, YouTube channels and everything in between being dedicated to discovering our ’purpose’ in life. The Japanese concept of ‘ikigai’ is one that continually pops up, so I decided to explore it in greater detail. You’ve probably heard about the Danish concept of ‘hygge’, the Swedish concept of ‘lagom’ and if you go back to the early 90s – it was all about the Chinese concept of ‘feng shui’. Now, it looks like ikigai is the latest trend in finding happiness. What is ikigai you ask? 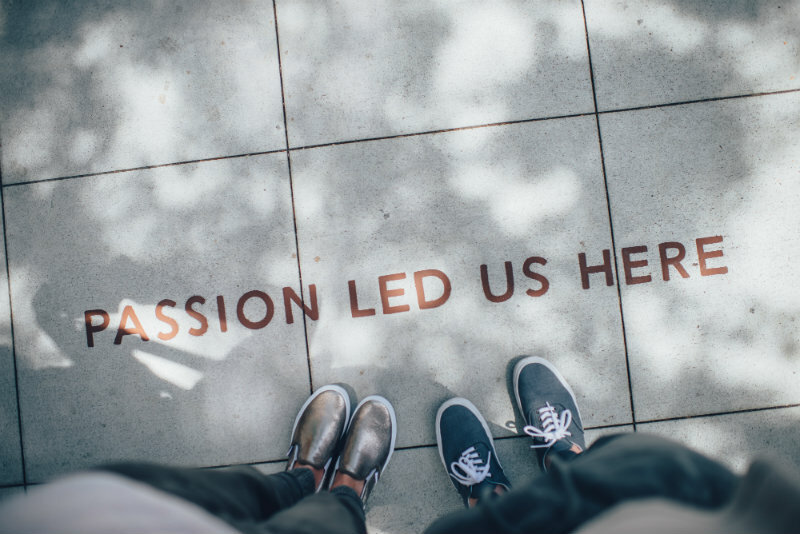 It roughly translates to ‘reason for being’, and the concept is concerned with finding the sweet spot between your passion, what you can get paid for, what the world needs and what you are also good at. Now I don’t actually believe anyone who says that if you’re super passionate about something that eventually it will just magically make you money. It’s a wonderful idea but if what you’re insanely passionate about is carving sculptures of famous people out of butter – your passion may never make you a millionaire. The point is, you still have to put in the hard work to make passion and profit work together. 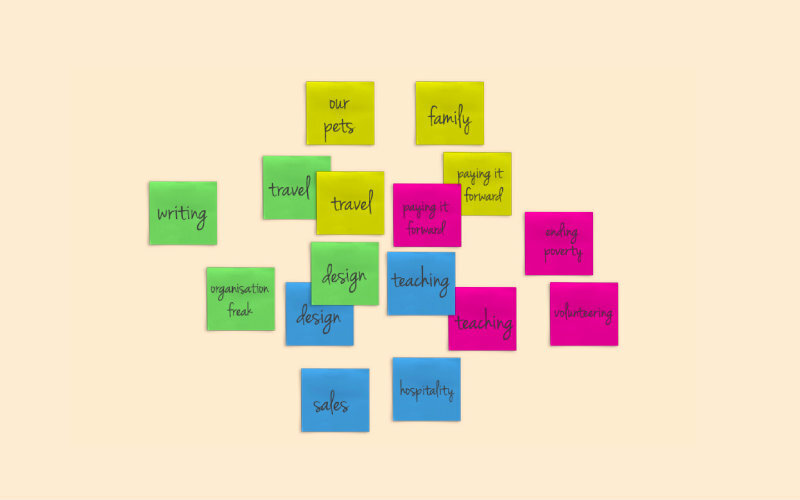 Below, I’m going to explain something really easy that you can do today with just a few sticky notes and a pen that’ll help you get the most out of life. It will help you to map out your ikigai. Experts estimate that each person has about 80,000 hours in their career. That’s a crapload of time to spend in the wrong career. So if we can’t just depend on our passions to find out true purpose in life then are we all just a bit screwed? The easiest way I’ve found to determine your ikigai is to get a bit visual with it. Note: If you want a visual representation of this, you can either watch the above YouTube video or read on to see what my ikigai map looks like. Grab sticky notes in 4 colours. On one colour write down the things you’re really passionate about or things that you love, this can be everything from computers to playing with your dog – the more the better. Each new thing must go on a separate sticky note. Now stick them up on the wall at the top. The placement is important. On the second colour, write the things you’re good at. Some of these things might overlap with the previous sticky notes and that’s great just write them again on the second colour stickies. Now stick them up on the wall just below and to the left of the previous notes. Again, each new thing must go on a separate sticky note. 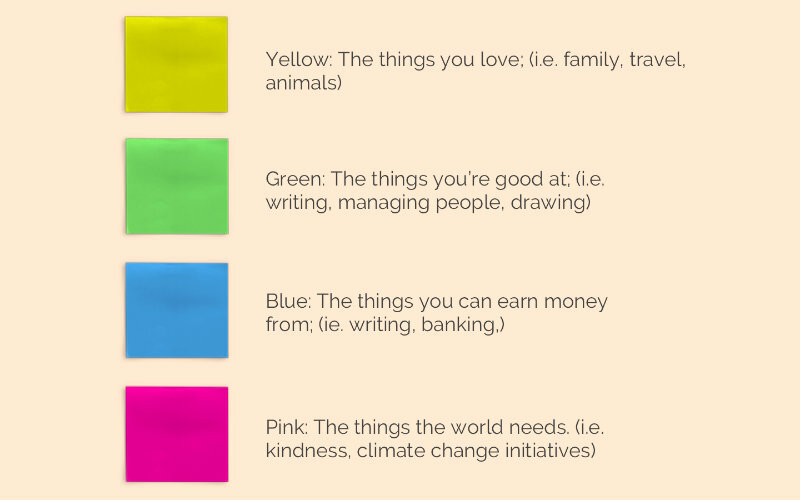 On the third colour, write down things you can earn money from. This is specific to you and your skills. So in the previous category, you might have said that you can fit 40 almonds in your mouth but unless someone will pay you good money for this skill, it doesn’t belong in this category. Stick these up on the wall at the bottom. The fourth colour is reserved for the things which the world needs. So write down any ways in which you could benefit the world, and stick them up on the wall on the right. Note: the colours that you’ve used are probably different to mine, but it will help to explain my personal ikigai map further below. Hopefully, now you will have some areas where all 4 colours overlap and this will help you to determine your direction in life. It helps if you remove some of the sticky notes that aren’t repeated anywhere else, so the only ones remaining will be the things that appear in more than one category. This is what my ikigai map looks like. You can see there are some which overlap which I’ve placed in the middle. From this, you can see how my ikigai or reason for being (otherwise known as the ‘sweet spot’) is a combination of travel, design, teaching and paying it forward. There is a good reason why we have placed the sticky notes in particular spots on the wall. 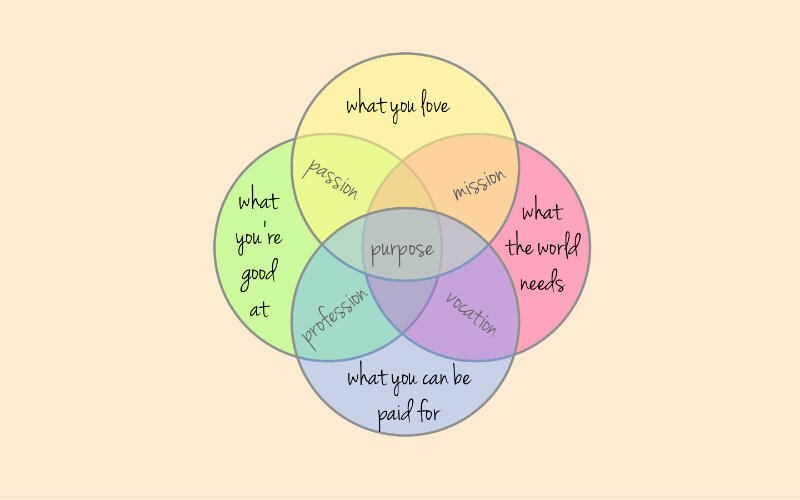 If you look at the below diagram, you’ll see the words passion, mission, vocation and profession at the overlapping points. Passion: The things that you love and that you’re also good at. Mission: The things that the world needs and that you also love. Vocation: The things that you can be paid for and also that the world needs. Profession: The things that you’re good at and also what you can be paid for. If you focus on the overlapping points, you will find yourself a lot closer to what your ikigai, your true purpose, actually is. Can you actually earn good money from it? Essentially these are what we have just mapped out with the sticky notes. If you haven’t found your ikigai yet, don’t worry. Not everyone has overlapping interests. It might help to complete the exercise again now that you have a greater understanding of the meaning behind it. Explore – go out into the world, outside of your usual routine – if you change nothing, nothing will change. Do things that scare you, at least once a week. Meet as many new people as you can to find out what it is you love and what you’re good at. Get good at something that makes the world a better place. Find what gives you a sense of achievement AND meaning. Be flexible. 10 years ago you were probably a completely different person. 10 years from now you will, once again, be a completely different person so don’t limit yourself to one passion. I hope that that helps you to find just the right balance of passion, purpose and profit in your life! If you’re interested in exploring this further, make sure to check out 80000hours.org for an awesome free resource that will help you to find the right career for you. Let me know in the comments below what your own ikigai map looks like. Did you discover something new that may help you find your purpose? I appreciate the logic way you explain how to find our own ikigai. 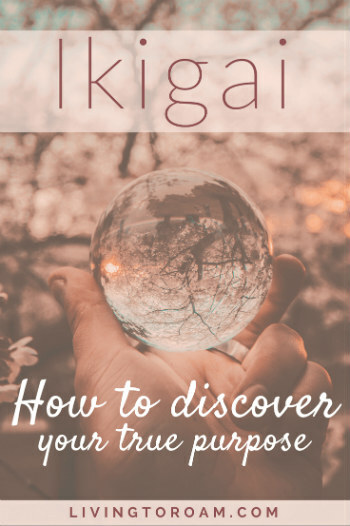 Your additional tips are very useful to get some more directions to find my ikigai and purpose as I feel a bit stuck. Thank you so much Veronika, that’s very kind of you. I’m so glad you’ve found this useful in finding your very own Ikigai as I know that I felt exactly the same way before I mapped out my own!